Queen Composter shares methods for increasing yields when gardening when space is limited. As a society we are too dependent upon food grown far away, and many communities are not food secure. 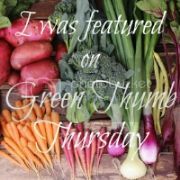 In my own area many of the local farms, despite being protected by an agricultural land reserve, are being gradually developed, making even the small amount of locally grown organic food even harder to find. Planting a garden, even a small garden, is important for the environment and more people are turning to backyard gardens in the same way our grandparents and great grandparents did with their victory gardens in the Second World War. Most people do not have the space for a large vegetable garden. For those of us living in urban areas with little outside space it can feel impossible. However, there are ways to maximize what is available and grow enough food to supplement the produce we buy. I am lucky to have a fairly large backyard but my garden plot is currently small and I have to maximize how I grow my food. So far this growing season I have been able to cut down on the amount of fresh produce I buy because we have been able to eat several meals each week from my garden. The easiest way to grow food in a small space is to use containers. Before moving to our single family home we lived in an apartment and a townhouse and this was the only option available to us. 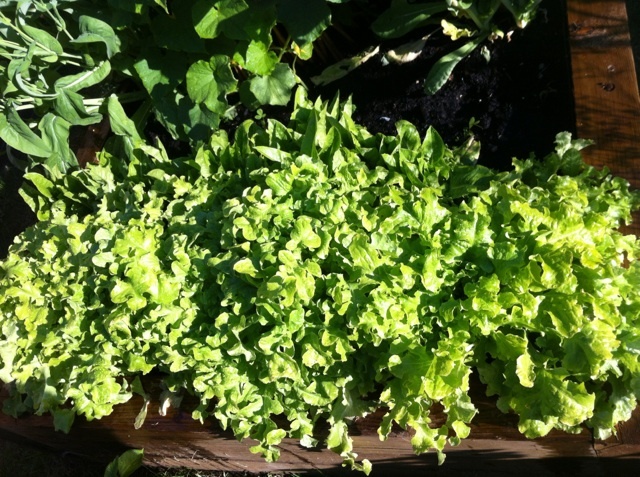 This can be very effective as most vegetables can be grown in containers. 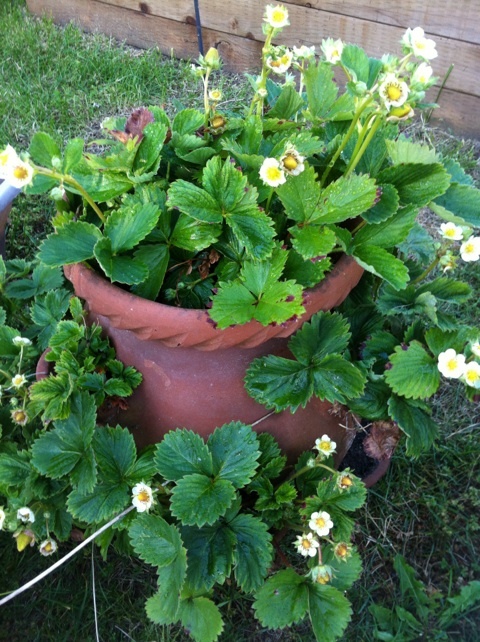 I currently increase the amount of plants I am able to grow using containers for tomatoes, herbs, horseradish, strawberries and some greens to supplement what I have growing in my raised beds. The main issue I have found with container gardening is that they require daily watering and require more fertilizing than garden beds. pick the berries before I get a chance to have any. I don’t have a lot of space for plants to grow out so instead I have my plants grow up. Some plants naturally grow up easily, like peas and beans. 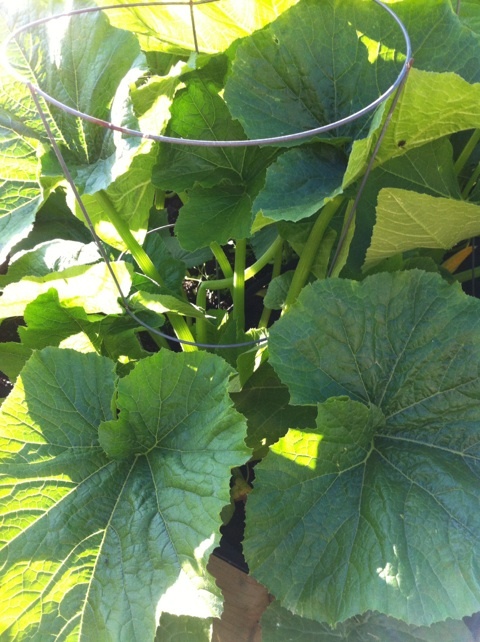 Other plants, like pumpkins and cucumbers, are vines and will grow up with some training. 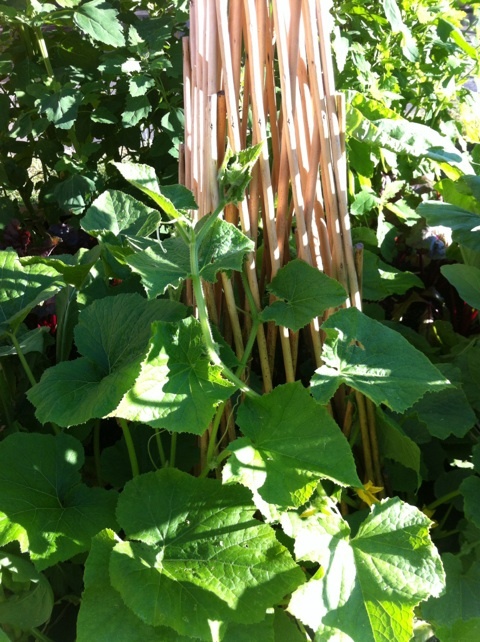 The cucumbers are beginning to vine up the trellis nicely. I tend to be overzealous with planting, not allowing my squash enough room to grow. This year I am trying an idea I saw on Pinterest: I am using tomato cages to keep the leaves growing up to help give the zucchini more space. My zucchinis growing up in tomato cages. To increase the variety of food I can grow, I plant early maturing plants in the same bed as later varieties. 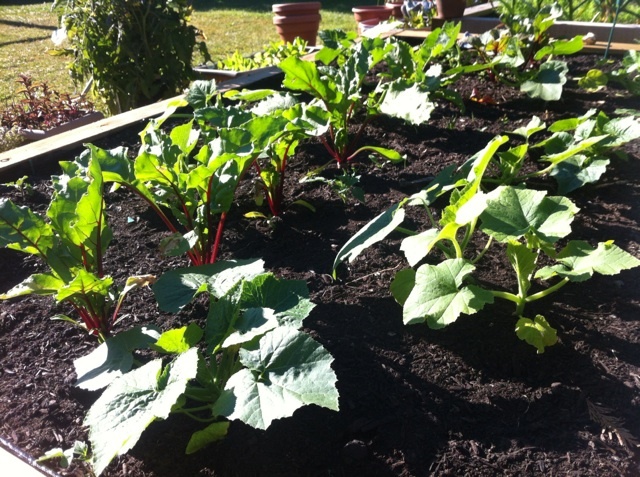 For example, I planted beets down the middle of the bed where I planted my summer squash. The beets are now ready for harvest just as the squash is exploding. Brussels sprouts, which are a Thanksgiving dinner tradition in my family, are very slow growing so I planted them in the same bed as my peas, beans and potatoes. Right now the latter are filling the bed, but as they finish for the season my Brussels sprouts will take over. The beets are growing down the middle of the squash. In between my rows of garlic I planted carrots and onions. 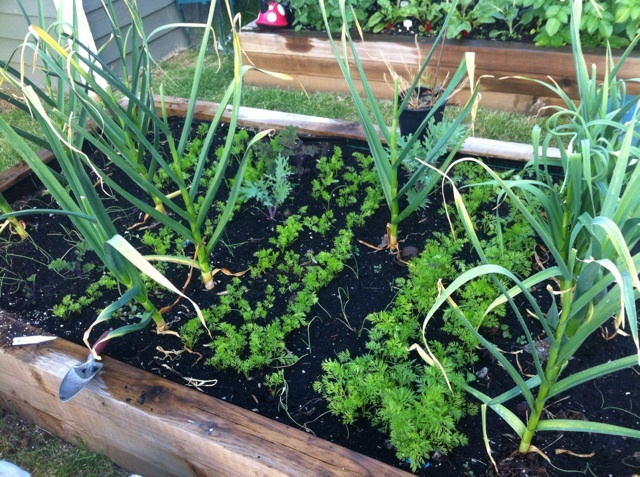 I pulled up the garlic yesterday, just in time for the carrots to fill out. I hope the onions fill out soon. filled out and I harvested the garlic. The onions are still quite small. Another way to maximize the amount of food grown in a small space is to fill an area rather than plant in rows. I sow seeds liberally and don’t thin out the seedlings as they grow. I use this for growing greens because I want to grow as much as I can before they bolt in the summer heat. Even though I have an outdoor space large enough for four raised beds, all of these techniques can be used for container gardening on an apartment deck or townhouse patio. The most important thing is to just start growing. It is the best way to make sure we have organic, locally grown food instead of food shipped from hundreds or thousands of miles away. I look forward to hearing about how the squash/tomato cage thing goes. I saw that on Pinterest and, in retrospect, I should have done that with my zucchini as well. Time will tell how the tomato cages for squash work in the long run, but so far they are working well. They help the leaves spread up and out rather than just out, giving lots of space between and under the plants. Last year I had a problem with lots of blossom drop - the little zucchinis not developing because the pollinators couldn't get to them (everything was too busy and full). This year I have a bunch of little baby zucchinis coming along well. Fingers crossed!